Mageia represents the magic one can find if they harness the power of community with a good codebase and selfless coordinators and developers. Mageia is a fork of Mandriva Linux, a worthy distribution in its own right. Most forks happen because of differences in opinion of the way the code or project is headed. Perhaps someone thinks a particular focus or feature should be followed or added. But lately we've seen two major forks out of concern for the future existence of the project. Mageia is one of those. Since it is a fork and uses Mandriva 2010 as its base, the system will be very familiar to users. And since Mandriva is very user-friendly, it and Mageia would be easy for users of other distributions to adapt to using. But Mageia's primary philosophy is rooted in the community. When the founders began the early stages of forking, they invited the community to participate. When they began packaging, they recruited community and even inexperienced maintainers. These "new guys" were giving mentors and taught the "business." Today Mageia proudly proclaims, "Mageia is about people - the people who make and the people who use Mageia the Linux distribution. We're completely community based, with everything that implies." The main thing that implies is that Magiea is "not dependent on the economic fluctuations and erratic, unexplained strategic moves of the company." From the user-who-just-wants-something-that-works perspective, Mageia is there. Mandriva was the original user-friendly Linux distribution, and Mageia continues the tradition. Starting with the installer, like most today, it's a graphical wizard that walks users through the process. The partitioning step is made easier with Mandriva's graphical representation of your drives. It's easy to decide how to partition if you can see a depiction of what's really going on. The remainder of the install is really just answering questions as to your preferences. 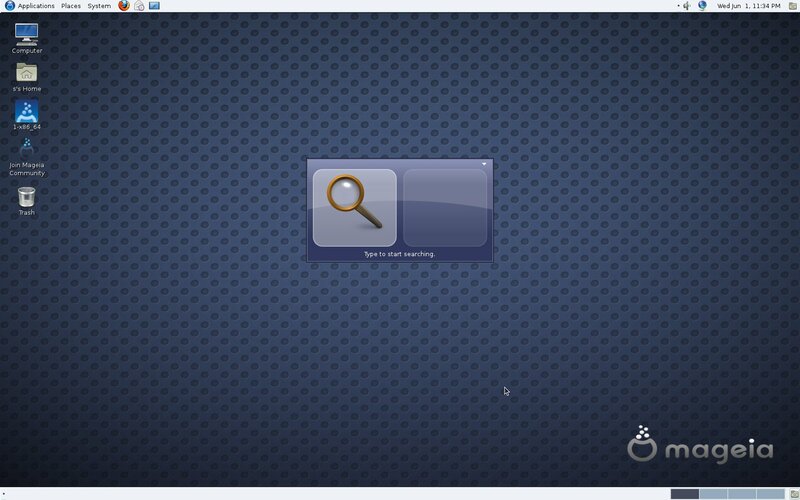 To configure or change configuration settings the Mandriva / Mageia Control Center is the place to start. From there you can setup or change settings for just about any bit of hardware or system configuration necessary in a graphical app using mostly a mouse. Network settings, 3D desktop effects, firewalls, or bootloader are just a few of the configurations available. 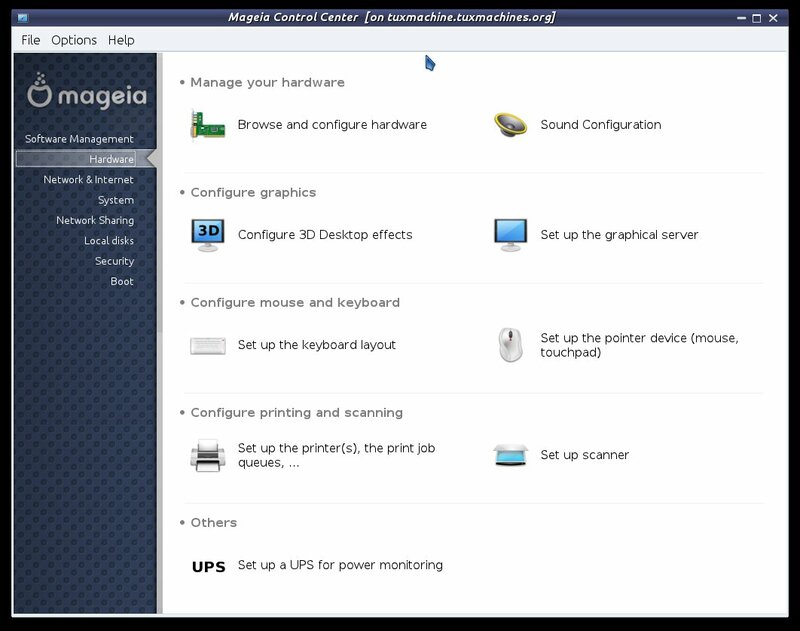 You can start the software manager from the Mageia Control Center or stand-alone from the menu. From within MCC, you will also have access to other package management operations. In either case, the graphical package manager is another point and click application that makes use a breeze. Basically, just tick the box beside the software title of interest and click Apply. RPMDrake, as it is sometimes known, will install your software and any needed dependencies automagically. Again, RPMDrake was one of the first graphical easy-to-use package management tool in Linux and today it is the results of years of refinement. Mageia ships with a nice selection of software, but there are over 14,000 more packages in 161 languages in their repositories. The desktops are reassuringly familiar. Panels and menus are where one expects them to be. Windows and buttons behave as most expect, as do the system trays, pagers, and task bars. Mageia will most assuredly have to move on to GNOME 3 in future releases, but for now those that prefer the familiar can get a bit of a cushion with version 1. Mageia features KDE 4.6.3, GNOME 2.32.1, Linux 2.6.38.7, X.Org X Server 1.10.1, GCC 4.5.2, and Firefox 4.0.1. Magiea takes all the good cumulative work that made Mandriva an excellent desktop Linux and moved it into a community-based environment that won't disappear. Uncertainty is a debilitating stigma and might explain why Mandriva continues to slide down Distrowatch.com's Page Hit Ranking. Some users are probably leery of moving into a distro that could quite possibly disappear. Mageia takes that uncertainty away and users are free to invest their time without worry. Magiea has over 100 developers and more are jumping on-board every month. So, come on in, the water's fine.